Gripandle is the easiest to use & most secure holder for your cell phone. 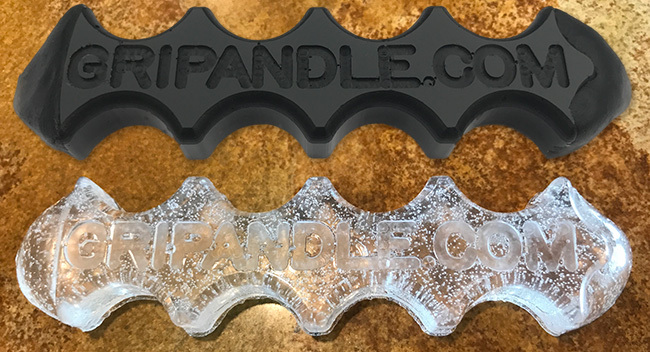 The Gripandle is a finger-molded piece of rubber that sticks to the back of your cell phone or cell phone case. It makes it easy to cup your fingers around the phone and hold it securely in one hand while scrolling or tapping with your thumb. How big is the Gripandle? Why did you make the Gripandle? My name is John Tremaine, and I've been a Realtor and Real Estate Broker for 20 years. I live on my phone. It's the most important tool I use in my business. But I found myself frustrated when trying to use the phone with one hand when I needed the other hand free. I tried all the widgets online. Elastic bands? Fine for taking selfies, but it takes both your hands to put it on your fingers. That kind of misses the point. Kick stands? Great for watching a movie, but at work I was chasing my phone around my desk trying to push a button. The thing that looks like a door handle? Try putting one of those in your suit pants pocket and standing in front of a client! I just needed something "grippy" to hook my fingers on so I could keep my thumb free. To solve my problem, I bought some silicone in a tube at the hardware store, built up a bead of it down the back of my cell phone case, and let it dry. It worked like a charm, but it looked unprofessional. When I let my friends and kids try it, they all said "That's cool. I want one too." So I had an idea. I drew up some plans, and had a mold made. This is the Gripandle you see today. "Come on. I know what you really use it for." I can already hear you saying, "You mean like texting while you drive?". Nope. Texting and driving is dangerous. I don't do that. I have 4 kids to feed. But what about just clicking the text icon with your thumb to read a text? Or scrolling through contacts to find a phone number so I can write it down with the pen in my other hand? I do that all the time! Actually it's more like Gripandle 5.0. Nothing is easy. My friends and kids (a.k.a. unpaid beta testers) told me early versions of the Gripandle were too tall and the tips got caught on their pockets. I trimmed them with an Exacto knife and had several molds made until I ended up with the final version you see on the bottom of the page. Gripandle's cost $5.95 plus $2 for shipping. You'll get it delivered by first class mail anywhere in the USA. Order additional Gripandles of the same color for $5.95 each and pay $2 shipping for all of them. Of course! If you don't like the Gripandle, send it back to me, and I'll refund your full purchase price plus shipping. It's less than a double shot caffe latte with almond milk. What have you got to lose? Color: Black or Clear. Please specify when ordering.